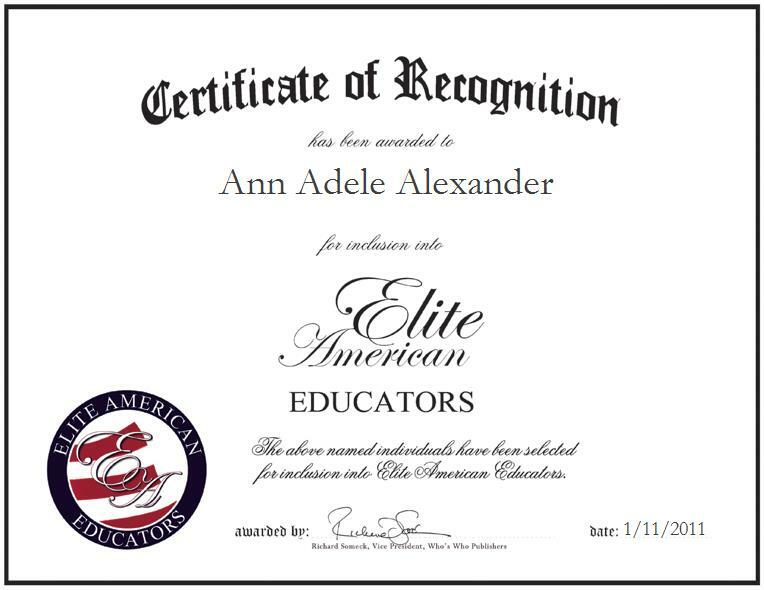 Lafayette, Louisiana, January 11, 2011, Ann Alexander, Special Education Teacher for the Lafayette Parish School System, has been recognized by Elite American Educators for dedication, achievements, and leadership in education. With 35 years of overall teaching experience, Ms. Alexander has developed an expertise in the instruction of mathematics, science and social studies. For the last 29 years, she has served in the capacity of special education teacher for the Lafayette Parish School System, where she is duly responsible for teaching sixth- and seventh-grade students with behavioral disorders and learning disabilities. Impassioned and determined, Ms. Alexander believes that learning about each student on a personal level is imperative to their educational success; thus, she makes it her priority to build strong student and parent relationships. She strives to reach and teach every student under her care by motivating them and maximizing their learning through appropriate activities. To keep abreast of industry changes she maintains affiliation with the National Education Association. A graduate of the University of Northern Colorado, Ms. Alexander holds a Master of Arts and Bachelor of Arts in education. Having been prompted to enter her profession through her love for children, she began her career with the Peace Corps as a fifth-grade teacher in Micronesia. Her passion for teaching grew and upon her return to the United States she became a reading teacher for the Lafayette Parish Public School System. Thereafter, she settled into her current position with the district. Ms. Alexander’s strong work ethic and perseverance is reflected in the numerous accolades she has been awarded with throughout her tenure. In 2000, she was named a semi-finalist by the Lafayette Education Foundation for their Middle School Teacher of the Year award. A recipient of the Teacher of the Year award by Carencro Middle School, her talent inside of the classroom has made for a gratifying career adorned with countless successes in the lives of her students.